Can Measuring Creativity Save Electric Brain Simulation From Its Sketchy Reputation? 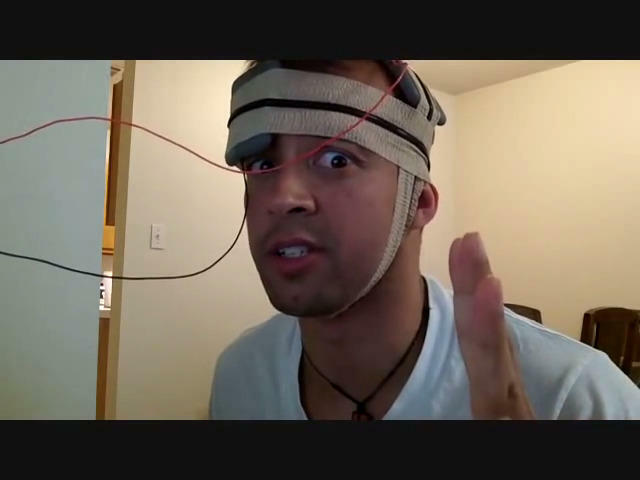 A growing movement of do-it-yourselfers have been trying electric brain stimulation at home and posting their findings on YouTube. Would you wire your head to a battery if you thought it might help boost your brain function? A quick Internet search turns up lots of videos of at-home tinkerers with electrodes strapped to their heads and nervous looks on their faces. Inspired by anecdotes and a handful of studies showing it can temporarily improve learning, concentration and mood, in the past few years do-it-yourselfers have taken to YouTube to demonstrate what’s known as transcranial direct current stimulation, or tDCS. Many boast about improvements in language learning, chess ability or even video game performance. Dr. Lila Chrysikou, an assistant professor of cognitive psychology at the University of Kansas, is vexed by the phenomenon, which she says could be dangerous. “For me, as a researcher, it’s an interesting choice, that people would go for using something that we are explicitly saying we don’t really very well understand,” Chrysikou says. Chrysikou herself is fascinated by the possibilities of tDCS, and she’s hopeful that it can be saved from the sketchy reputation created by the DIY community and perhaps someday even become a mainstream alternative to psychoactive drugs. Chrysikou, who was a postdoctoral research fellow at the University of Pennsylvania’s Center for Cognitive Neuroscience before joining KU’s psychology faculty, is among the first researchers to look at whether tDCS can bolster creativity. But unlike the DIYers, she’s taking a cautious, methodical approach. In controlled experiments, her lab has studied what happens when electricity dampens function in the brain’s frontal lobe. “The part that we’re using for selecting specific aspects of our memory about the world or making high-order decision or problem solving – if we have that part of the brain not as engaged as it usually is, that can benefit performance on aspects of flexible thinking,” Chrysikou says. 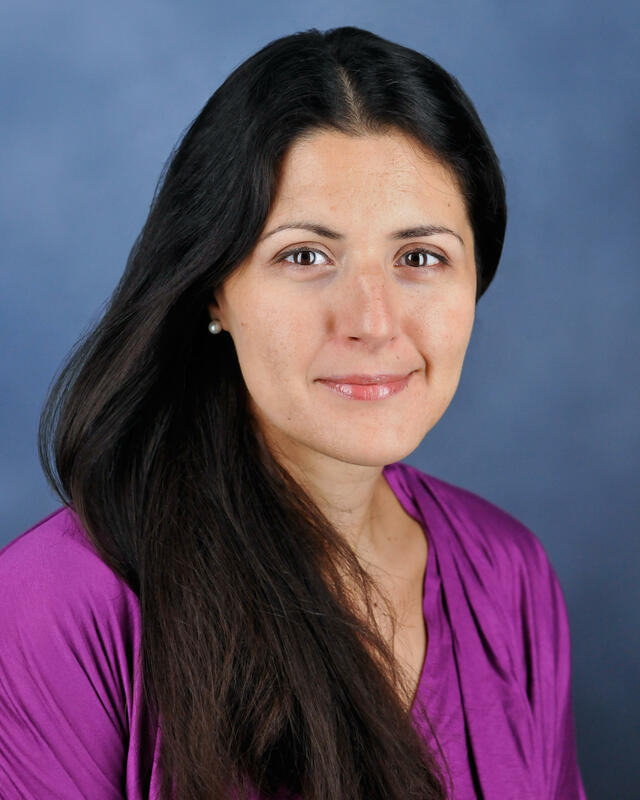 Dr. Lila Chrysikou is an assistant professor of psychology at the University of Kansas. She explains that our ordinary thinking causes us to see objects in terms of how we’ve used them in the past. When that function is inhibited, we notice more basic qualities that are usually taken for granted – things like shape or size or weight – and that creates a new perspective. It’s the kind of thinking we sometimes do in a crisis. Early studies by Chrysikou and a handful of other researchers have shown that electrical stimulation does seem to increase the capacity for flexible thinking. When subjects are wired up and shown everyday objects, they come up with more alternative uses for them and do it faster than subjects without the stimulation. But is this really a useful measure of creativity? Dr. Mark Runco, a cognitive psychology professor at the University of Georgia and founder of the Creativity Research Journal, says the phenomenon is complicated. “The so-called standard definition of creativity is that creative things are both original but also in some way effective,” Runco says. Creativity isn’t just a matter of coming up with a lot of original ideas, according to Runco. It’s also coming up with the one idea that will solve a complicated real-life problem. So creativity for an architect might be a very different combination of abilities than creativity for a painter. And because creativity happens in so many different ways, it’s not necessarily something that predictably shows up in controlled laboratory experiments. Thanks to breakthroughs in neuroscience and genetics, creativity research has boomed in the past few years and the notion of enhancing creativity and other brain functioning has captured the imagination of a general public eager to try websites, apps and other technologies that claim – often with little evidence – to make people more creative. 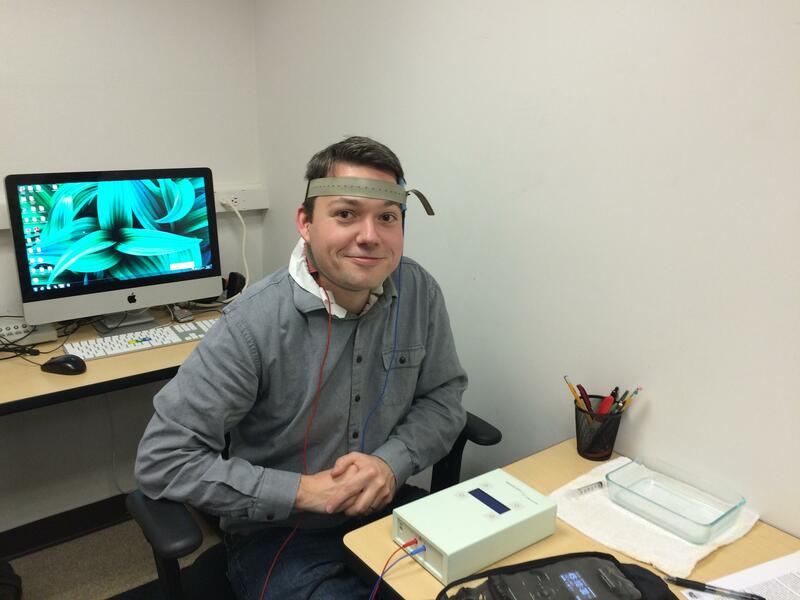 KCUR's Alex Smith tries at transcranial direct current stimulation at the Chrysikou lab at the University of Kansas. Runco says many individual tests done in labs, like the one at KU, can be valuable for evaluating aspects of creativity but they’re just discrete pieces of a bigger picture. “Maybe you learn something there. You match that with what we know from studies in the natural environment, so that the sciences as a whole can provide a rich understanding of creativity,” he says. There were no research tests going on when this reporter visited Dr. Chrysikou’s lab, so I signed a waiver and tried tDCS myself. After dipping the electrodes in liquid, Chrysikou put one on my forehead and one on the back of my neck. When she turned the device on, there was no big zap or flash of lightning, just what felt like small mosquito bites under the electrodes. I didn’t feel more creative, but I didn’t take a test to find out. Many more research subjects will get first-hand experience with tDCS at the KU lab thanks to a $175,000 grant from the Imagination Institute in Philadelphia. Along with research partners at the University of Pennsylvania, Chrysikou plans to study how tDCS can be used to the greatest effect and whether it creates long-term benefits. She acknowledges her tests can only tell so much, but they’re part of the exhaustive work that’s required if the field is going to move beyond the marketing hype of brain-boosting gizmos.